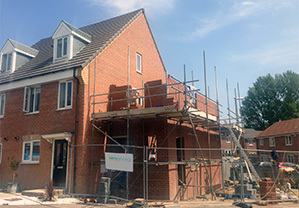 Our extensive experience of designing and building domestic foundations makes us the obvious choice for individuals and companies who are planning a new residential construction project. Whether you wish to build an extension to an existing property or a completely new home, Belowground Ltd has the expertise and resources that you need. We can complete entire piled foundation constructions in accordance with designs provided by structural engineers, at highly competitive rates. When building a new property or an extension, foundation piling is not something on which you want to take a gamble so let the experts take care of all the details on your behalf: call Belowground Ltd to discuss your requirements today. In addition to entire foundations, we are also more than happy to construct just the foundation piles or the piles and the reinforced slabs / beams alone. We undertake jobs of all sizes so please do not hesitate to get in touch with us whatever your needs. If you are looking for a more comprehensive service, we can also oblige. For new projects, we offer a full design and construction service so you do not have to hire your own structural engineers to produce designs unless you really want to do so. At Belowground Ltd, we have a great deal of experience with a wide variety of foundation underpinning methods, enabling us to undertake strengthening and repair jobs on behalf of our customers in the United Kingdom. In some cases, poor quality foundations may need to be repaired to ensure the continuing structural integrity of the property in question. In other cases, it may be necessary to underpin existing foundations in preparation for the addition of an extra storey to the property in question. If you would like to find out more about our foundation repair and strengthening services, please call or email whenever convenient. All of the work that we carry out is in compliance with relevant building regulations and in accordance with the Institute of Civil Engineers Specification for Piling and Embedded Retaining Walls 2007. We can submit designs for approval to the local building control office and arrange for inspections to be carried out on your behalf if desired. With a fleet of modern mini piling rigs and screw piling options available, we can work on restricted access sites with ease. We offer all of our clients a 12-year guarantee, backed by a comprehensive insurance policy. We also guarantee to provide you with a competitive service, enabling you to keep your foundation piling costs under control. If you want the best foundations at the best prices, Belowground Ltd is the only sensible choice. From your initial enquiry, we offer a full or tailored solution for your piling and/or foundation requirements. We can do piling only, or piles and foundations/reinforced slabs. We can use structural engineers designs you have provided, or provide a full design and construct package using our own structural engineers. Whichever option you choose, all of Belowground Ltd’s work comes with a full 10 year guarantee as standard, with the option of extending to a 12 year insurance backed guarantee. All work undertaken by Belowground Ltd will follow building regulations, and all piling undertaken is in accordance with the Institute of Civil Engineers Specification for Piling and Embedded Retaining Walls 2007. Belowground Ltd will liase directly with building control, submitting designs and arranging inspections for the work we undertake at your home, on your behalf if you so wish. Our modern fleet of mini piling rigs and screw piling options, enable us to construct piled foundations/reinforced slabs in the most restricted access sites, including piling inside properties. We are able to offer a 12 year insurance backed guarantee on all of our work for your piece of mind.